When the speed of a source equals the speed of sound (v = c) the wave fronts cannot escape the source. The resulting pile of waves forms a large amplitude "sound barrier" that makes sustained flight at this speed difficult and risky. 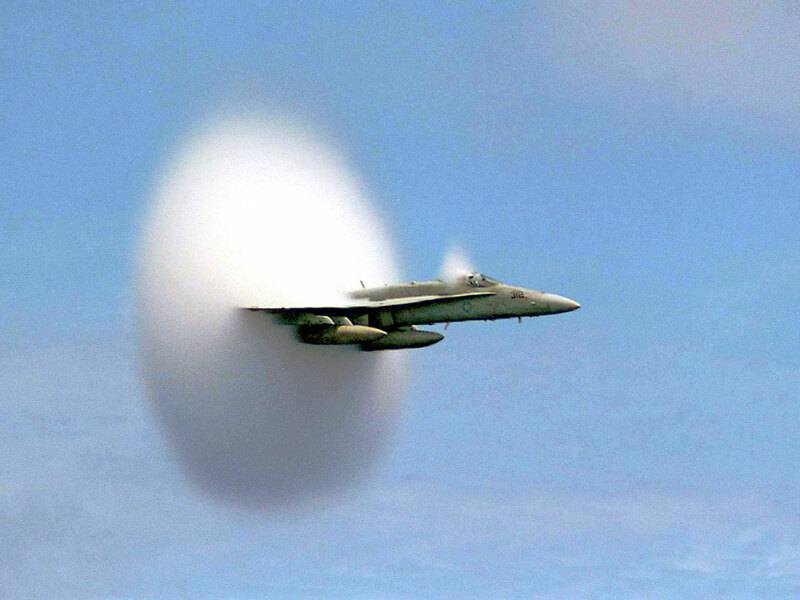 The term "sound barrier" or "sonic barrier" first came into use during World War Two. Fighter pilots engaged in high speed dives noticed several irregularities as flying speeds approached the speed of sound: aerodynamic drag increased markedly, much more than normally associated with increased speed, while lift and maneuverability decreased in a similarly unusual manner. Pilots at the time mistakenly thought that these effects meant that supersonic flight was impossible; that somehow airplanes would never travel faster than the speed of sound. They were wrong. When the speed of a source exceeds the speed of sound (v > c) the wave fronts lag behind the source in a cone-shaped region with the source at the vertex. The edge of the cone forms a supersonic wave front with an unusually large amplitude called a "shock wave". 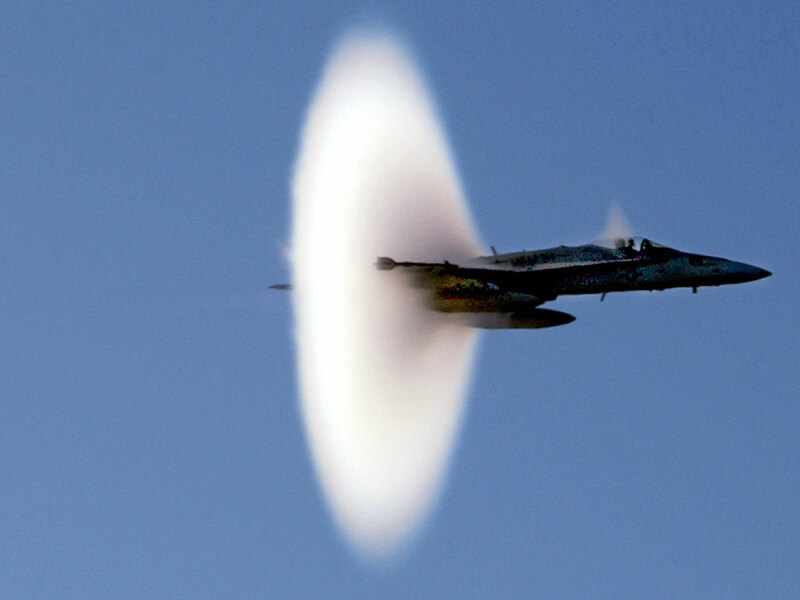 When a shock wave reaches an observer a "sonic boom" is heard. Jet fighter planes with conical shock waves made visible by condensation. The shock wave from a supersonic object is a cone composed of overlapping spherical wavefronts. As any one of these wavefronts forms, it propagates radially outward at speed c and acquires a radius ct. At the same time the source, traveling at speed v moves forward vt. These two displacements form the leg and hypotenuse, respectively, of a right triangle and can be used to determine the Mach angle at the vertex of the shock cone.